Several artists and writers have utilized the graphic novel or combined written and visual narratives to cover aging and diseases of later life: Roz Chast’s Can’t We Talk About Something More Pleasant? and Wrinkles by Paco Roca come to mind. There is something different and far more intimate about Aliceheimer’s. Dana Walrath uses images to process both the difficulty and also the joys of bringing her mother to live in her little farmhouse for several years as the Alzheimer’s progressed. The description of her creative process is so rich—it gives great meaning to the finished book we hold in our hands as readers; knowing about all the different layers and symbolic processes imbues the work with greater depth. 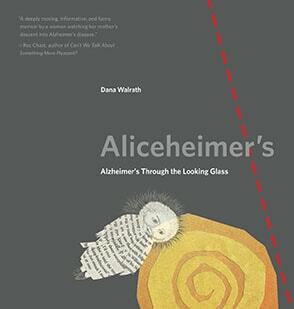 Through short vignettes and collaged images, Walrath shares her personal experiences as a means to explain and explore what it is like to live with someone with Alzheimer’s. Readers coping with similar circumstances in their own families might gain some useful tips about how to support independence and how to preserve dignity. Though she covers some of the difficult situations, she also shares the moments of humor and unexpected beauty. The book does not deny the severity of the disease; the emotional and interpersonal wounds are well-covered. But Alice is a whole person, and is treated as such throughout the book. By the end, the reader has a sense for who Alice was and who she became and perhaps wishes to have met her, even briefly. The world is so lucky that Walrath took on this “hard job” of working through the “unfinished business” with her mother. The raw honesty in the images and words bring humanity to the disease so often talked about in catastrophic terms. As science and medicine address treatment and hopefully cures for dementia, we need to ensure we are also tending to the human relationships impacted and changed through Alzheimer’s and other dementias—revising the story as Walrath says.